Easy to make and delicious spicy shrimp flavored with wine and garlic. In a medium mixing bowl, add garlic, saffron (or sazon goya), crushed red pepper, turmeric, salt and pepper and mix gently. Add 2 tablespoons butter and 1 tablespoon olive oil to pan, add onion and cook onion until transparent (4-5 min) over medium heat, add contents of bowl, stir and cook another 1-2 minutes. Add wine or beer, bring to boil and reduce for 2 minutes over medium high heat. 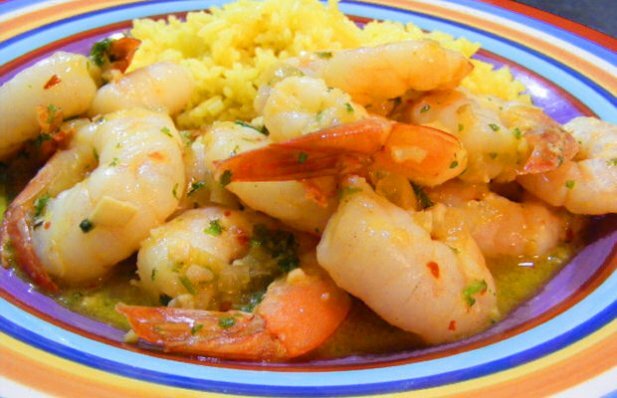 Add shrimp, parsley and rest of butter, cook over medium heat until shrimp are done, serve over rice. 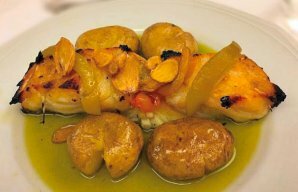 This Portuguese grilled codfish (bacalhau grelhado) recipe is easy to prepare and delicious. 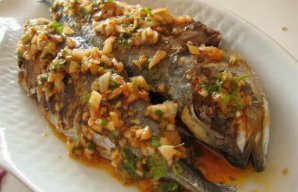 This delicious Portuguese grilled mackerel with garlic sauce recipe (cavalinhas grelhadas com molho de alho) makes a great meal for 1 person served with boiled potatoes and a salad. 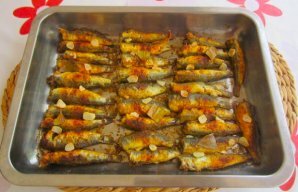 This Portuguese oven roasted sardines (sardinhas assadas) recipe is easy to make, yet very delicious, serve with a salad or tomato rice.